Today I am sharing 5 tools that I absolutely can’t live without as a virtual assistant. These are tools that I use in my business on a daily basis and that I think will be great to be recommended as well, these tools will help you to make your work life so much easier for you to manage. My favorite tools that I recommend you have in your online business! LastPass is the online tool you must have in your online business! I was introduced to this tool when I attended a webinar and was so amazed by this software because as the name suggests, it’s a tool that manages and stores all your passwords. I have to work on numerous clients’ case sensitive information and I really appreciate the invention of using this tool, because I loved it so much I started to use it in my business. Now you can use it to store strong passwords for your emails, websites that you visit frequently as well as banking information. Use LastPass to help you create strong passwords, and it automatically lets you log in when you visit a saved site from the LastPass vault. Asana is the online tool you must have in your online business! Asana does it best! You can use this platform to schedule a specific task. This can cover the week or for the whole month. Now how can you use Asana in your business? You can manage your personal projects for the day, the week or month, and it does come in handy when you need to have a reminder to do specific tasks for each hour of the day. Asana is also useful in creating projects and also allows you to collaborate with team members and track the progress of a client’s work, it’s beneficial to use depending if you use it as a personal reminder to keep track of tasks you want to accomplish or to allow your clients to see the progress of their task, when you are completing it. I highly recommend it, because I know you are living a busy life and you want tools in place to make your life simpler throughout the day. I should point out that I just really love seeing the unicorn icon when I complete a task, hope you do too. Grammarly is the online tool you must have in your online business! 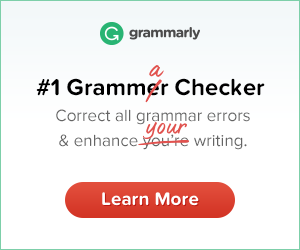 Get your Grammar in check with Grammarly From the moment your computer starts, you want to make sure that Grammarly is in place to help you as a second pair of eyes for when you need to send off those email messages, even when you are creating content for your blog. Now I am not eliminating the fact that you should outsource this task if it’s not a strong point for you, I still get a third opinion from another human being. I do recommend Grammarly because it does check and keep your grammar in place if you are a LadyPreneur on a budget! Evernote is the online tool you must have in your online business! You might be wondering what Evernote is and why it will be beneficial to use in your business every day or on a need basis. Yes, Evernote is a little life savior you can say goodbye to bookmarking when you visit pages in the past and tag pages by search or even label them by notes. You might be saying how can this come in handy, well back then when you use to bookmark a page, the only way you could search for a page is if you visit that page often or even remember the name! When using numerous pages per day or even the week, how can you keep track of such pages? This is where Evernote comes in and the beauty is when you do tag and clip a page it stays forever. Dropbox is the online tool you must have in your online business! I use Dropbox to save all my clients’ work and information. It’s simple; you can create numerous folders and all Dropbox does is automatically sync and update your clients’ information once you save it in the Dropbox folder on your computer or when you sign into the site. You will have to create an account with the site in order to save your clients’ information. You can also use Dropbox for even your personal files. This tool will be useful for you because you can, at any time store all your documents, invoices, blog content ideas in Dropbox. This can also be used to store and back up information on your site if it needs to be saved somewhere. Thought that was hard? Now go through all those information that you have been using for yourself such as files, content, you can even suggest to your clients’ to store their information via this software, and the beauty of it is if you do not need to download such information it can be easily shared via a link. Now that you have seen my 5 everyday tools that I cannot live without, share in the comments below your must-have tools, and let’s see how these tools can help increase productivity in your business and benefit your clients’ lives. Could Your Personal Style be Losing You Opportunities? Today’s post is all about knowing and creating your personal style and allowing it to reflect your brand without saying much to your prospective as well as current clients. What am I referring to? I will let Luisa talk some more about this. We are a society who as a whole is lured into spending our money, time and interest on everything that is visually attractive. How many times have you been blown away by luxury packaging? Can you count the times you’ve wanted to buy an item that was more pleasing to the eye than its mediocre counterpart? How important is your personal appearance and could you be losing opportunities by not investing time and effort into maintaining your very own presentable style? This got me thinking about the importance of style and personal image, not only for visual purposes but in order to help you present yourself to the best of your ability in both your business and personal life. Are you hiding behind a required suit? For some job roles, you may be required to dress in a certain way or meet a certain level of dress code. In some cases when a job role doesn’t require such, some service providers come to the conclusion that if there are no strict rules for their work wear, they don’t need to focus on their presentation skills either. The truth is that even if your job role requires you to wear a suit every day, it doesn’t instantly guarantee that you will look smart and be able to present yourself and your company in the right way. After all, it isn’t what you wear – it’s how you wear it! I’ve met so many females who struggle to dress for business. Your personal style needs to start dressing for success! So you are trying your best to stay well clear of jeans, you often drag out an ill-fitting suit in an unflattering colour from decades ago, or you may end up looking like a child who has raided your parents’ wardrobe by wearing clothing that is far too old for you. It is easy to hide behind amazing branding online, but at some point, your clients have to deal with you and if you feel as though you lack style and presentation skills then your client will see that too! You should never overlook the fact that you (and only you) are the best possible tool in your business so you need to work that to your advantage. You are the face of your business and let’s be honest, it’s always better for every face to belong to a happy, pleasant looking person that appears confident and comfortable when you see them! Stand out from the crowd and claim your personal style! I’m not just a stylist who knows about the important of style in business; I am living proof that a solid personal brand has the ability to take your business to wherever you want it to go. If you’re struggling to get your head around all of this, think of “bad style and poor personal branding” as a big, ugly spot on your face that you can’t disguise. It would knock your confidence when meeting new people and when trying to talk business, it might prevent you from looking and feeling your best thus, you are unable to present yourself in the way you’d hoped. When you look your personal best, you feel amazing about yourself and when that happens, that transcends across every aspect of your life, including through your communication and presentation skills! Style doesn’t have to be expensive, cruel, unethical or uncomfortable. Some of my most favoured looks have been outfits that have cost no more than £10 – but appear as though they’ve cost far more! Don’t confuse style with dressing up! Dressing up means adapting an appearance that isn’t usually you and that can be difficult to pull off every day. Few of us have hours to spend on our appearances, so we try to focus on what you can achieve in a short space of time. Let me help you dress better and find colours and styles that suit you for your next business engagement. Bio: Luisa Kearney is a professional online personal stylist who offers virtual personal styling services.